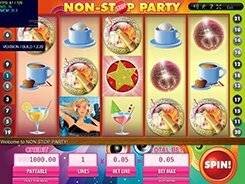 Powered by Gamescale, Non-Stop Party is a colorful, flamboyant and breathtaking video slot with its theme revolving around disco parties. Changing a bet per line ($0.1 to $5) and the number of lines you want to have in play (1 to 21), you may wager anywhere from $0.1 to $105 per spin. The slot features a wild symbol depicted by the Blonde Girl. The wild helps complete winning combinations by standing in for other symbols. Besides, getting five wilds on an active payline awards the largest jackpot of 10,000 coins (or $50,000 on the max stake). There is also a scatter symbol (the Brunette Girl) that unlocks 15 free spins, during which all wins are multiplied by x2. If you land three scatters again during the free spins round, you get 30 more free spins! Perhaps, the most lucrative feature in the game is the Champagne Bonus activated by landing five champagne bottles on a payline. In the bonus game you are to select from a few drinks and grab a decent cash prize. PLAY FOR REAL MONEY!